Hi Friends~! 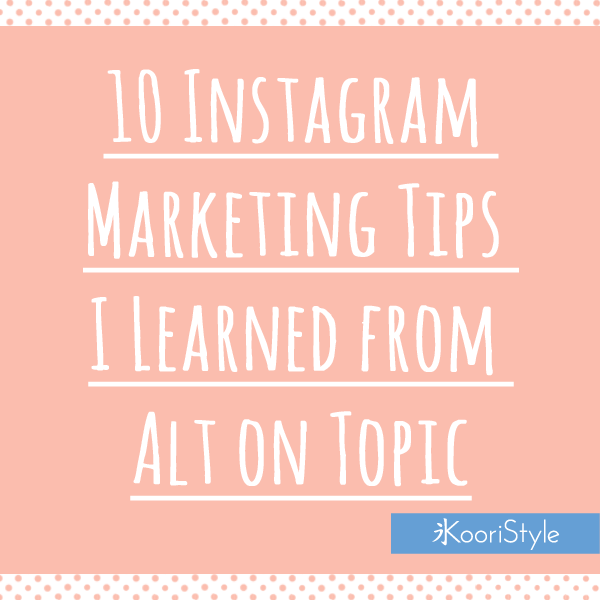 Last October I got to attend Alt on Topic, and days later I wrote the “12 Things Alt on Topic Taught me About Pinterest”. This time I’ll talk about the “Instagram Marketing” class that was curated by Susan Petersen of Freshly Picked. She was super kind and gave us a lot of advice to implement in our Instagram Marketing strategy. Hashtags are super important. Using the perfect #’s could lead to more followers! Keep track on trending hashtags so you can implement them too in your product description. Show more images of the creation process or a behind-the-scenes. Create good content that could be a good tool for your followers. Make your images eye-catching! Try to use consistent colors or filters on your images. them easily and know their feedback. You could also make some giveaways as a ‘thank you’ for your followers. Post your images around the same hours. Try to post around 1 ~ 3 times a day. Hope this information was helpful. Do you have another tip for Instagram? Leave a comment below, I’ll love to hear it! See you soon ♥!